*Premium Alarm dropdown option includes a larger 12 V lithium battery pack for higher output and longer life. 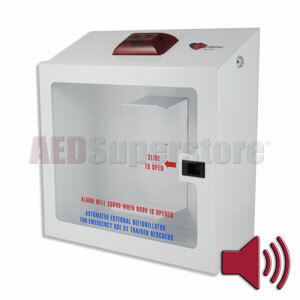 HeartStation Compact Surface-Mount AED Cabinet with Audible Alarm and Strobe Light. This junior cabinet is perfectly sized for smaller AEDs like the Welch Allyn AED 10. Just like larger cabinets, the sturdy metal construction protects and prominently displays your AED. Door-activated alarm and flashing strobe light alert everyone the AED has been deployed for rescue.